← Experts agree, houseplants are good for you! How can you create a garden with 12 months of color that’s easy to maintain and tolerates weather extremes? Conifers are the answer. 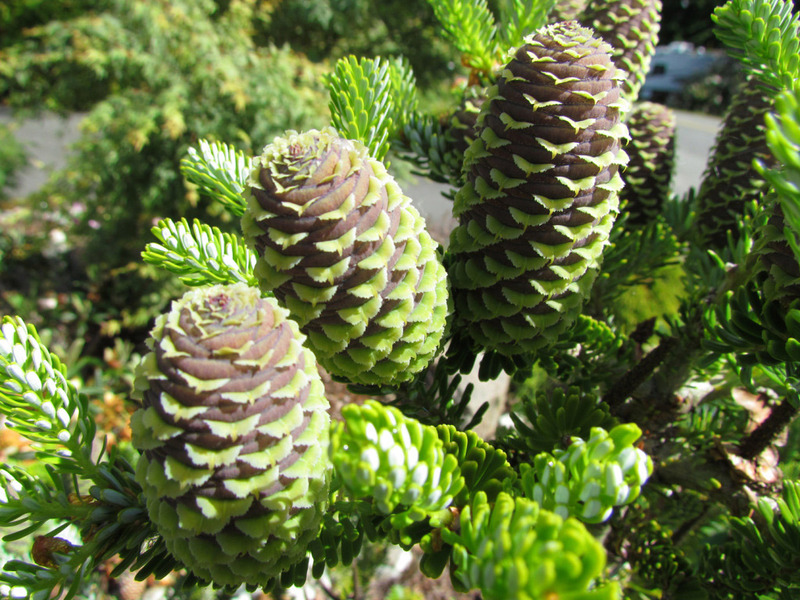 Conifers are like living sculptures that you can use to accent and create the bones or framework of your garden. Conifers offer an incredible palette of color, texture and form from which to choose the perfect specimen for any spot in your garden. They are classified in sizes ranging from miniature (less than 1’ in 10 years) and dwarf (1-6’ in 10-15 years) to intermediate (6-15’ in 10-15 years) and large (15’ or more in 10-15 years). to blues and silvers, gold, plum-purple and white. Textures add so much character to these plants. There are the sculpted fans and sprays of Hinoki cypresses, bottlebrush needles of spruces and firs, stiff or soft needles of pines, feathery foliage of Japanese cedars and some that look like coral reefs. Forms vary from well-behaved ground covers to low spreaders, globes and mops to narrow sentinels, and broad pyramids to towering spires. 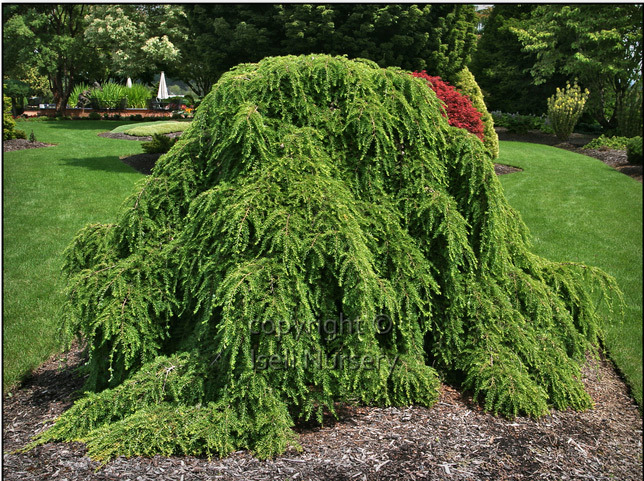 Weeping conifers add drama and movement to any garden. It’s hard to find words that can portray the incredible beauty and diversity of conifers. 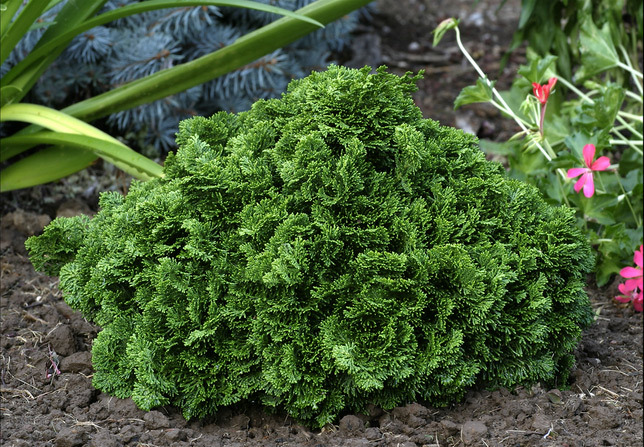 For inspiration you can search the web for www.iselinursery.com , one of Garland Nursery’s main suppliers. There you can see individual pictures of the myriad of conifers available and also some gardens incorporating them into the landscape. upright grower (thriller) with a fuller rounded plant (filler) and a trailing plant (spiller) makes a harmonious mix. Pines and spruces seem to be hardy enough to leave out in pots all winter. Most other conifers are hardy if planted in the ground but potted specimens should be moved into a garage or some other protected place when temperatures get to low 20’s or lower. Potted conifers also look great on patios, decks and balconies. 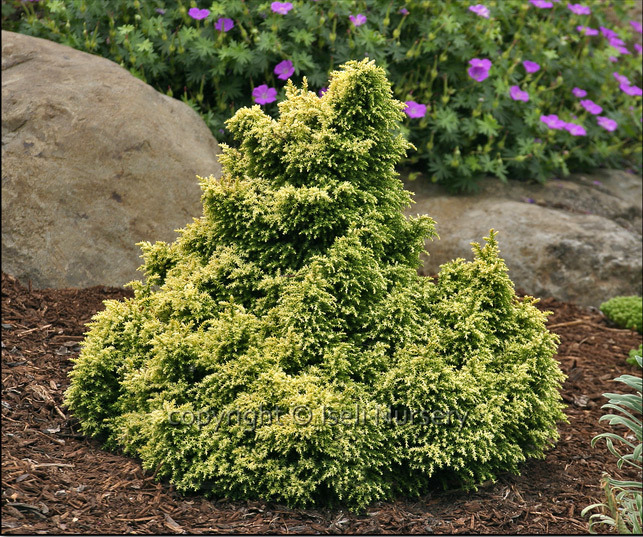 Garland Nursery carries a huge selection of conifers in sizes ranging from 4” starter plants to larger specimens with a knowledgable staff to help you find the perfect plant for anywhere in your garden. This entry was posted in Uncategorized and tagged Conifers, Gardening. Bookmark the permalink. Love your blog, Karen. I am always learning something new!